There are so many different ways to present 50+ images from Western Mexico. Instead of a web page, I've opted for this video slideshow with music. You can watch it on your computer, and it's also iPod video compatible. To upload it to your iPod, all you have to do is add it to your iTunes library, then sync. 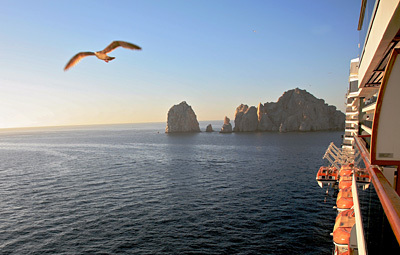 The video starts out with a series of images from Cabo San Lucas. I photographed them with a Canon Digital Rebel XT and either a 17-40mm L or 75-300mm IS lens. I worked both in town and on the outskirts. Everything shown in the first series was within walking distance of the port, although I did a lot of walking. Then there's a transition with the gull shot (the one featured in this post) and a sunset. Now you'll find yourself in Mazatlan. This was my favorite destination, as you'll see from the sheer number of photos I shot during this day. Then another sunset shot, and you're in Puerto Vallarta watching a parasail being prepared for the first flight of the day. You might want to ready my story about The Night of the Iguana to help you understand the setting for the next series of shots. I then wrap up the show with a series from a couple villages I visited south of the city, then back to port at night. To make this presentation, I first assembled the images and added the music in iPhoto 6 using the Slideshow function. I then exported the presentation to my Desktop. Next, I opened the video in QuickTime 7 and reviewed it to ensure it played back correctly. To make the presentation iPod compatible, I then exported out of QuickTime using the "Movie to iPod" setting (File > Export > Movie to iPod). Now the video can be played on both the computer and the iPod. If you want to watch this travelog of Mexico, you can download the movie here (16 MBs, 4:14 minutes, fast start playback in your browser). The music title is "Montoya Malaguena" by Carlos Montoya. You can find more of his work in the iTunes Music Store by searching on "Carlos Montoya." Hope this provides you with a good introduction to an excellent photo excursion destination. Nice shoots, thank you very much! Also a nice idea to make a video slideshow out of it. I enjoyed the video slideshow. I think this format will eventually surpass the photo albums of the past. People used to spend hours fastening photos to albums. Now, using a digital camera; a computer; some basic editing & slideshow software and blank DVDs, special occasions/events and vacations can be saved in a beautiful, interesting format. Great pictures Derrick... I love how vivid the colors are in your photographs. One of my favorite pictures is the one of the three pelicans sitting on a wall. Great Shots. Howdy. I just noticed that your blog looks like it has a code issue at the very bottom of your site's page. I am not sure if everybody is seeing this same bugginess when browsing your website? I am using a different browser than most people referred to as Opera, so that is what might be causing it? I simply wanted to let you know. Thanks for posting some great information.